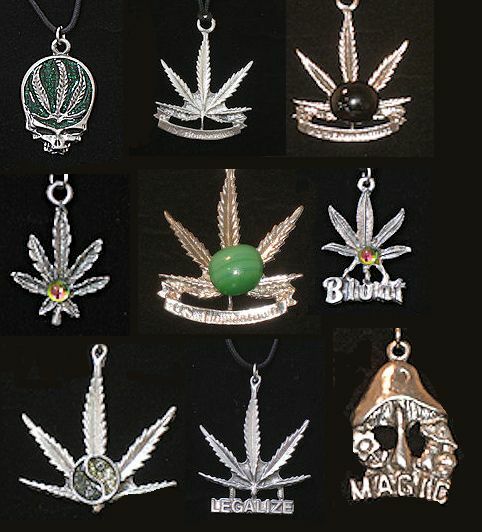 These assorted pewter necklaces have primarily a Palm Leaf theme. Each necklace is strung on an 18" leather cord. Price is for one dozen necklaces. The assortment pictured is representative. The one you receive may vary slightly. MADE IN THE USA. These sell by the dozens at any festival or fair if you hang them on the isle. An easy display is to loop them over a long bungie cord, then hook it to either side of your canopy frame so they hang above your jewelry cases. The larger the display and assortment of styles, the more you will sell. It is not uncommon to move more than a hundred in a weekend at a show or flea market with a large crowd. When you pack up your booth, just leave them on the bungie cord and slip a plastic grocery sack over about a foot of necklaces and knot it loosely above the bungie cord to keep the necklaces from tangling. Then throw bungie cord and all into a tote and it's packed up in five minutes. At the next show, hang up your bungie, pull off the sacks and you're back in business in a couple minutes.